Seven doctors face charges of serious professional misconduct over alleged failures that allowed Harold Shipman to murder more than 200 people undetected. BBC News Online looks at the background to the Shipman case and why medical experts decided to investigate the doctors. Q: What was Harold Shipman convicted of? 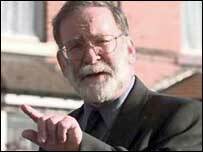 Family GP Harold Shipman was jailed for life in 2000 for murdering 15 of his patients and forging the will of one of them. A public inquiry later decided the 57-year-old had killed at least 215 patients over 23 years while practising in Hyde, Greater Manchester, and West Yorkshire. He died in January this year after hanging himself in his prison cell, leaving the families of his victims no explanation for his acts. The high court judge who led the Shipman Inquiry said the GP, who injected many of the patients with fatal doses of diamorphine, may have been "addicted to killing". Q: Why do seven other doctors now face charges of serious professional misconduct? The General Medical Council (GMC) launched an investigation into the doctors after criticism in the third Shipman Inquiry report. Six GPs - Dr Peter Bennett, Dr Susan Booth, Dr Jeremy Dirckze, Dr Stephen Farrar, Dr Alistair MacGillivray and Dr Rajesh Patel - will now appear before a GMC professional conduct hearing. A seventh, retired pathologist Dr David Lyle Bee, is also due to face a hearing in September. The report queried the failure of the GPs, three of whom still practise in Hyde, to notice the high number of Shipman's patients who were dying. The doctors were also criticised for regularly signing off cremation forms for Shipman without the correct checks. Q: How did Shipman's murders remain undetected for so long? By the time he was caught he was killing at a rate of one patient every 10 days, the Shipman Inquiry heard. But the GP preyed on vulnerable people, usually choosing elderly women living alone as his victims, which made it less likely his actions would raise suspicions. He often administered the lethal injections on home visits - and worked for many years as a solo GP, free from the scrutiny of other practice doctors. He was able to stockpile diamorphine by issuing false prescriptions and retaining leftover supplies from patients, helped by an inadequate system for monitoring controlled drugs. Shipman was only investigated after he made a clumsy attempt to forge the will of 81-year-old Kathleen Grundy in 1998 - prompting her daughter to go the police. Q: What did the subsequent police inquiry find? After evidence was found linking Shipman to Mrs Grundy's murder, publicity surrounded the case. Many other people came forward to Greater Manchester Police with concerns about relatives who had died in similar circumstances. Eventually the police made the difficult decision to exhume bodies for forensic tests, resulting in the 15 murder charges. Q: What has been done to prevent what Shipman did occurring again? A system of checks has been put in place which should safeguard patients from the rogue actions of a solo, or single-handed, GP like Shipman. The introduction of primary care groups, which lump together doctors' practices within an area, means GPs no longer work in isolation. The Shipman Inquiry has also called for a drugs inspectorate to be set up to prevent doctors stockpiling controlled drugs as he did. The GMC, which disciplined him but failed to strike him off, said its approach would be different now. The guidelines for doctors signing certificates for causes of death and for cremation have also been under scrutiny.